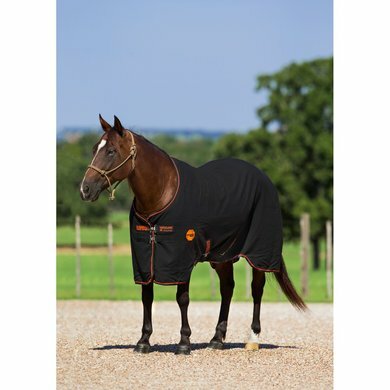 The Rambio Ionic Stable sheet is very suitable as a transport blanket, stable rug or sweat blanket. The blanket has a polyester outer layer and contains Ionic material on the inside. This blanket is unlined and is not waterproof. Equipped with a double hook / eye closure on the chest, leg arches for more freedom of movement, cross surcingles and a leg strap. The advantages of Ionic in the blanket are that it provides an improved concentration, faster energy is available, waste is removed faster, existing injuries heal faster, lower blood pressure, risk of injuries is reduced and more collagen is produced. Ionic consists of tourmalines, this is a type of crystal, when it is finely ground to a powder, this substance gets an electric charge. The fabric is both hot and cold electric. The electrical charge of the tourmaline dust converts the molecules suspended in the air to negative ions. Negative ions are air molecules that have an electron that makes this molecule negatively charged. 85% of these ions are absorbed through the skin and the remaining 15% via the airways. In the Ionic fabric used for this blanket, this tourmaline fabric is processed, this looks like small black balls. The negative ions that arise around the tourmalines dust eventually end up in the bloodstream through the body, once in the blood these ions cause the oxygen atoms to diminish in size, causing the blood fibers to become wider. The result is that more space is created and the blood circulates better and more efficiently. A more efficient circulation of blood then results in the oxygen, nutrients and serotonin required to be transported faster through the blood to organs, cells and muscle tissues. This also means that the waste products are disposed of more quickly. All this means that the body is restored faster and the chance of injuries gets smaller and existing injuries heal faster. 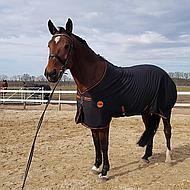 The blanket shows its full effect on my horse, I can only recommend! Super quality always a perfect cut that fits perfectly. Ionic properties will be more visible in the long term, in use but I am satisfied with this purchase. I recommend! The Rambo Ionic Stable Sheet has a very nice fit. Does not rub and also easy to use under another blanket. Blanket is often used here. I am very happy with it and I think so too. 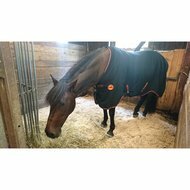 Question: Can it be fixed with a liner system to another Horseware stall? Answer: No, this blanket is not suitable for the liner system. Question: Is the material on the inside of the blanket smooth or fleece? And is the blanket just 0 gram? Answer: This blanket is 0 grams and not lined. The inside of the blanket is smooth, no fleece. 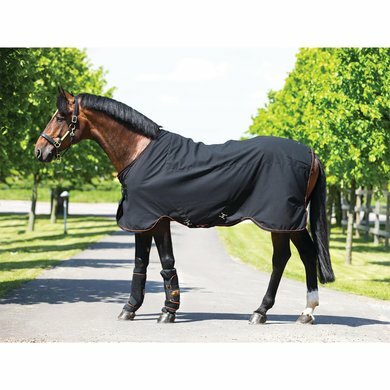 Question: Questions about the Rambo Ionic Stable sheet: * How long does the blanket have to have had enough effect: does it have to go on day and night? Or a few hours * is the blanket both cool or warm? Answer: Advice is to build up, so start with two hours and after a few weeks the blanket can go on horseback 24 hours a day. The blanket is not cooling and also not warming. It is a therapy with negative ions which is also measurable (not comparable with back on track). The inside of the blanket is printed with the crystal Tourmaline, which has the property that when negative ions are released. Negative ions promote blood circulation and restore the PH balance in the body, resulting in more oxygen supply to cells and tissue. The immune system is also strengthened and blood pressure is reduced (there are many examples of hot horses that benefit from Ionic and become calm).